The start of the month saw the Swedes join the Russians in siege of Berlin, while the rest of the Russian army moved on to secure Brandenburg. Not only would this ease any Russian intervention in Saxony, but it would hinder any Prussian attempt to retake Berlin. 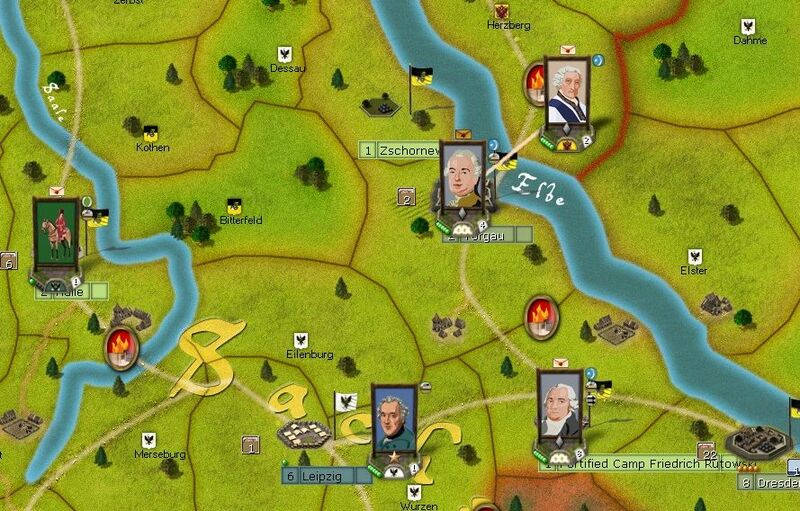 In Saxony, some of the Austrian-HRE army fell back on Dresden expecting Torgau to delay Keith's army and in any case there was a desparate need to regain supplies and reorganise . Given the Franco-Russian gains elsewhere, protecting Dresden became more important that destroying the remnants of Frederick's army. Thus the road to Saxony was clear for the French and Russians. 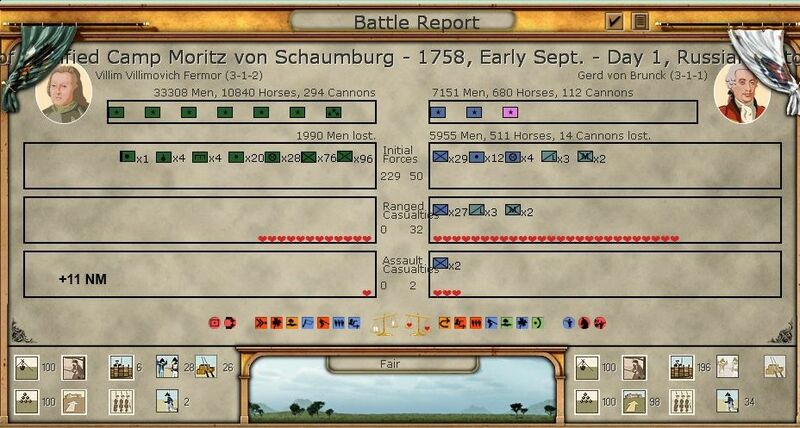 So it is all going to come down to a set of battles in Saxony. In effect, all I need do is not to lose too badly while the Russians clean up along the Oder. Critical, more than anything else is to hold onto Dresden. – probably the one time in the game I really messed up my orders. I'd originaly decided to contest Torgau, then decided to retire to Dresden. I'm not sure if I forgot to change these orders or forgot the check the route chosen by the default move algorithm. 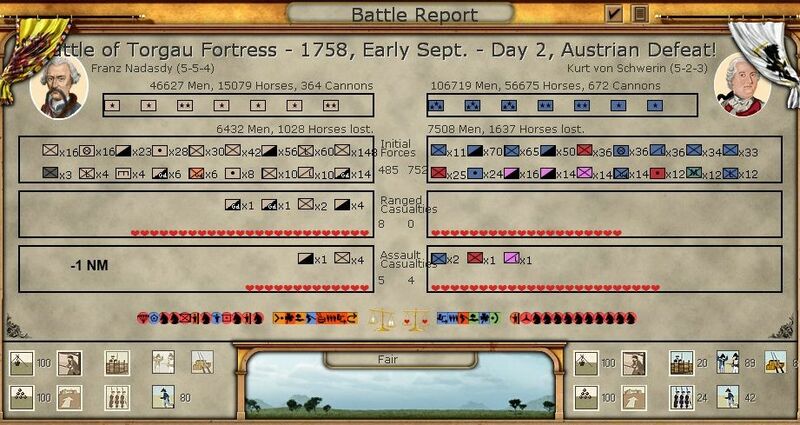 In outcome I wasn't that upset at the result, it indicates that even the fresh Prussian force is pretty battered. – which all went on a emergency production of depot battalions for the Austrian and HRE armies. 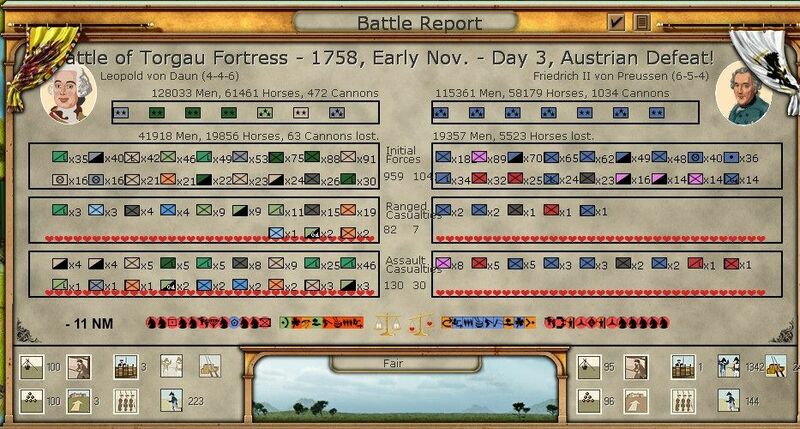 By the start of October, the Austrian Army is a complete mess. 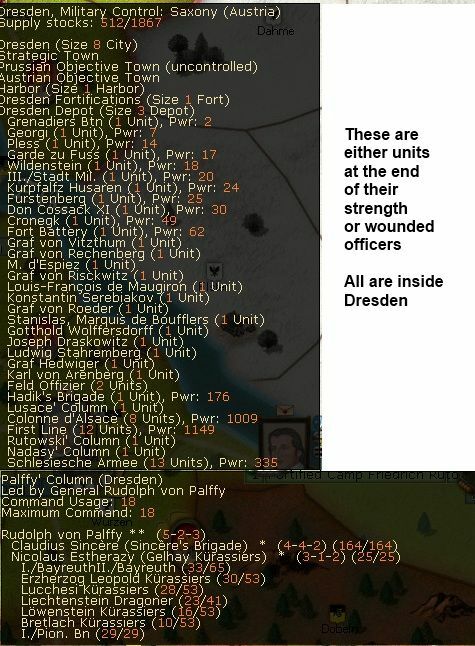 Dresden is full of officers recovering from their wounds and many corps have few if any brigadiers. At least I've recovered Organisation in most units so this is as good as it will get for some time. I also decide with the Austrians despite the mess they are in to set up a spread of formations to protect Dresden, deploying back to Wurzen, some units to Oschatz and 1 corp to Dobeln (in case Narwhal tried to lunge directly at Dresden). In addition Nadasdy deployed to Torgau so as to trigger a response by Daun if the Prussians managed to attack Torgau directly. And the French take Halle, destroying an ad-hoc force that was obviously sheltering there. 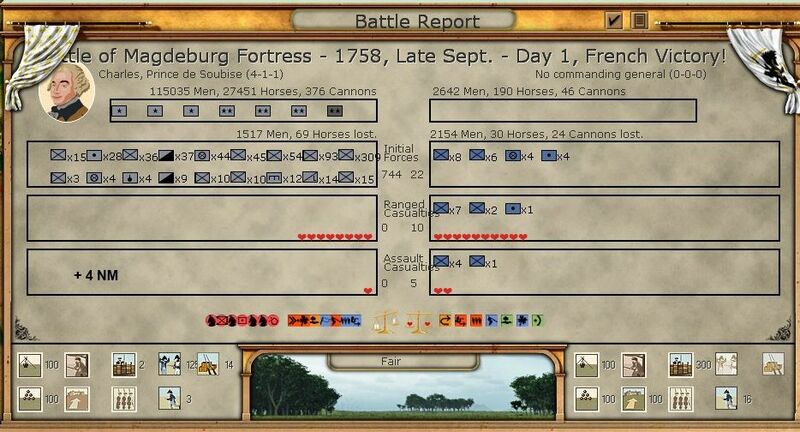 & Nadasdy was wounded, even worse his entire corps collapsed so Frederick gained the artillery and the supply trains. Day 4 – Daun stumbled onto Frederick heading for Torgau as he moved via Wurzen. I lost as I was on the offensive. In consequence, as opposed to defending, in 4/5 battles I was on the offensive (for which I am ill-suited) and that sort of turn makes me fear for my ability to actually finish off the Prussians. So I decide to concentrate the Austrians at Oschalz and build a depot there. While the French deploy from Halle (leaving a minimal garrison) to join their formations to the north of Torgau (where I also build an emergency depot). In the event, both sides take no more offensive actions in the latter part of October. 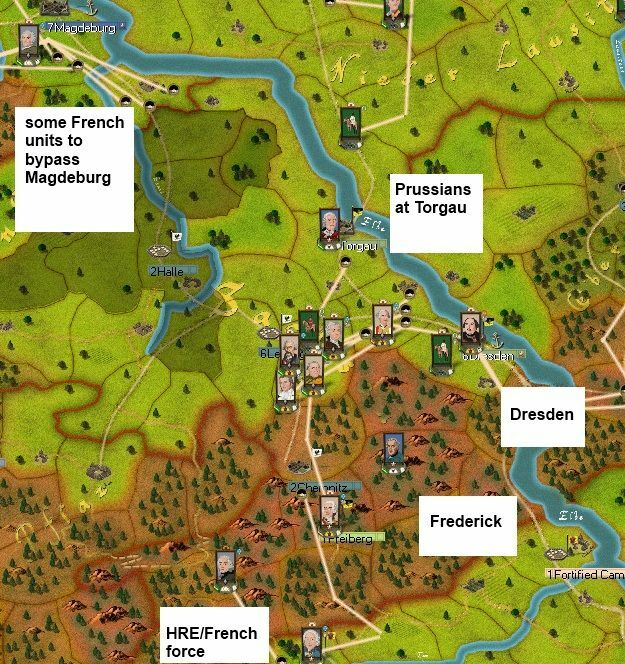 In truth, for me, its a race to take Breslau and Glogau (3-4 turns depends on the speed of the siege works) before Frederick does serious damage in Saxony. My fear is still the loss of Dresden as that is a large depot and a weak fort. My hope is that even with Nadasdy's supply wagons, Frederick must be low on supply and can't collect reinforcements unless he retires to Leipzig and hands the initiative back to me. So November dawns and the snow clears. In the event I have to attack in stages. First the Austrians and the Russians (this is luck, just reflects the speed of the two stacks), then the French. 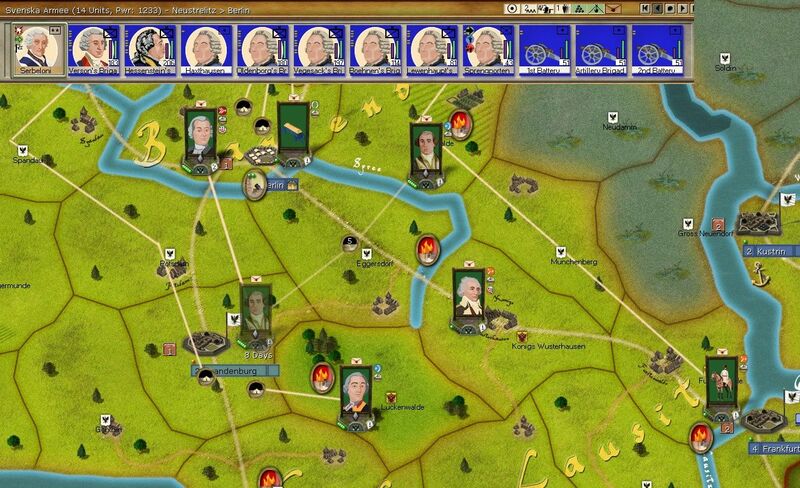 but Frederick breaks contact and moves to Wurzen and the French occupy the city with no fighting. I think I've just denied him his last chance to find a decent supply stock. 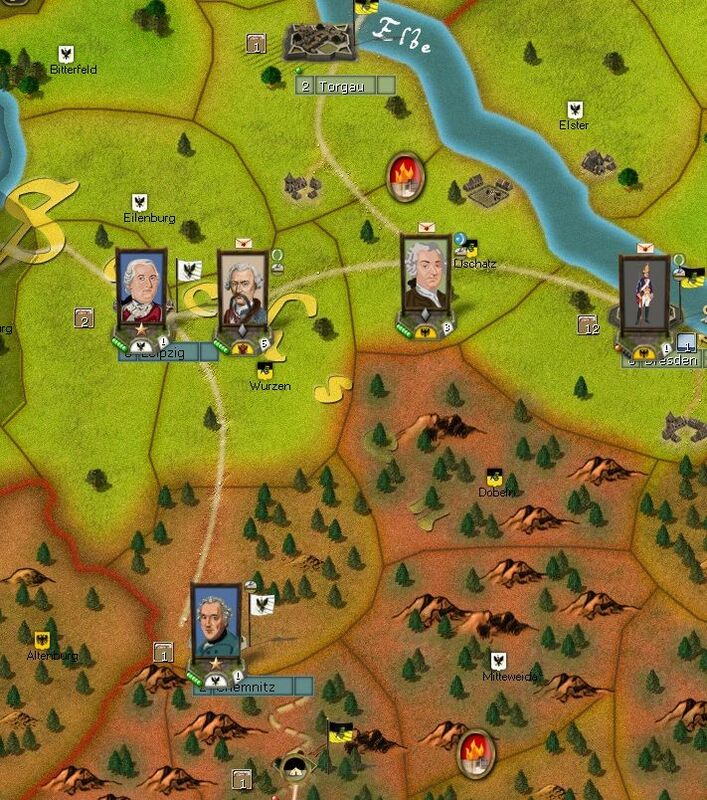 By late November, Clemont is on the scene with the last French units to unlock and the German mercenaries. He races for Halle to try and block that off. To make sure that Frederick has no chance to rest, the French attack at Wurzen, in yet another battle of appalling savagery. And although Frederick drives the Franco-Swedish force from Halle. That, quite simply is that. I'll do another post in a few days with views and reflections, but compare the losses at the end of 1758 with those up to the end of 1757. At that stage our respective losses were 40,000 Austrians for 30,000 Prussians (here). All credit to Narwhal for taking this to the end as I offered to end it when I took Magdeburg as after that the French would be able to fight in Saxony. Equally he came damn close to finishing off the Austrians but I think his supply and replacement position must have been dire. Facing the still relatively fresh French and Russians there was no way could he break out and by fighting in Saxony not Silesia he was dependent on taking a city rather than just doing enough to protect them. If you sort out the Austrian units, they had around 1,500 power left (out of 11,000 a year back). Now the problem with that end is this would have been great if it was a simulation of the invasion of Germany in 1945. But its meant to be the Seven Years War. And one feature of that was it was the end of a period of military thought when armies disengaged after battle. Either a critical fortress had been protected or left under siege. I'm not an expert but I can't think of a single multi-day battle in the period. I think its too easy to keep on battering away. Some of it is attitudinal, we as players don't regard an Army as a huge expense that can only be risked in limited circumstances. But I think some of it is the simulation and one idea is to increase ammunition consumption, making multi-day battles so much harder. But equally we have tended to gravitate to a 'big army' manner of playing RoP, so some of this is the natural consequence of our mode of play. To me though, its a pity, you have a very elegant game of feint and manouver than ends more like the Soviet entry into Berlin than the time period of the game. Still think its a brilliant game though. I'm sorry if that was a bit of a rush but am trying to save what I can from the Paradox forum. Ideally I would have liked to have managed to save some of the comments and debate as that added quite a lot to the narrative and discussion. I'd equally love to be able to rescue the 3 'how-to' AARs with Narwhal but that would require us both to be free at the same time (I can't cut and paste his origninals). Equally I have a 100+ post PoN AAR I am trying to work out how to save. 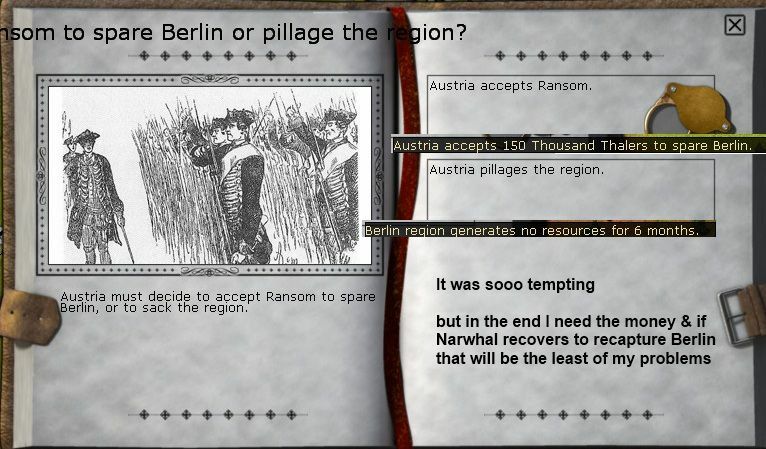 Some of the material over there is pretty ephemeral but Narwhal's Learning from Prussia is another that should be seen as one of the classics - still worth reading and still a great insight into RoP. It also looks like Bornego/One Armed Mexican's brilliant RUS foursome will be lost. Do you have any ideas about possible house rules to make PBEM more historical? Im personally toying around with the idea of separete diplomacy and treaties as being possible between different factions, could it work? Btw, did you have the long combat delay on?? Die Zieten wrote: Do you have any ideas about possible house rules to make PBEM more historical? I think there is a fundamental issue with MP. 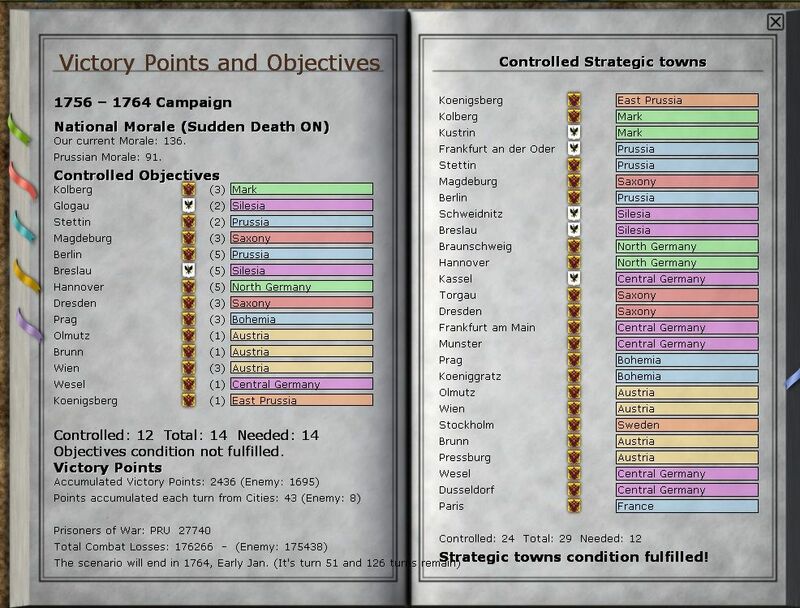 If you want to play a historically restrained game you are better off sticking to SP, the problem with MP is yes it can be done in a fun way, yes you both enjoy the historical details but at the end, its about winning, so its hard to play with too much restraint. You can see that in the last 6-8 turns as reported, I had Narwhal (unusually) on the ropes and I was not going to let go- and it became more like Feb-May 1945 than the Seven Years War. We did have a chat about multinational forces and as I mentioned I agreed to be reasonable with the Swedes. 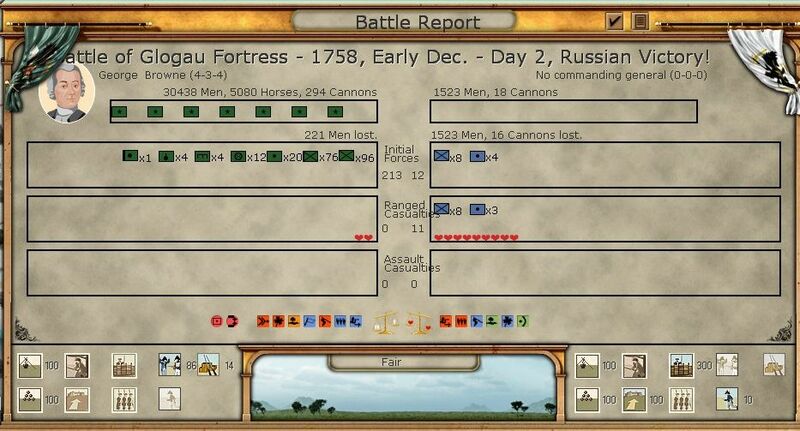 I do think its unrealistic for anyone but a Russian to command Russian troops and its pretty unrealistic to combine Austrians and French - but then in a game they can end up operating together, in the real war they fought separate campaigns. So I'm not sure that being too restrictive is that realistic, who knows what would have happened if the French had forced their way to the Elbe. On the Prussian side it would be better if the Anglo-Hannoverian forces were poorly aligned to the Prussians and so on. How to model that is a challenge. I do think making RoP 3 faction (say Austria, Prussia and France-Russia) would help, but if you play say RUS, you'll see the 2 white players co-operate as opposed to compete. So it would be a very different game and my guess is any flaws in the 2 alliances (which were there) would only really come to a head at the point of victory. As in this game, its easy to see Austria as a as much a loser as Prussia, it might get Silesia back but those losses would mean that France and Russia were now the dominant powers. But I'd love to play a RoP mod that treated intra-factional diplomacy properly. as to the other question - we used the medium delay. loki100 wrote: I think there is a fundamental issue with MP. If you want to play a historically restrained game you are better off sticking to SP, the problem with MP is yes it can be done in a fun way, yes you both enjoy the historical details but at the end, its about winning, so its hard to play with too much restraint. 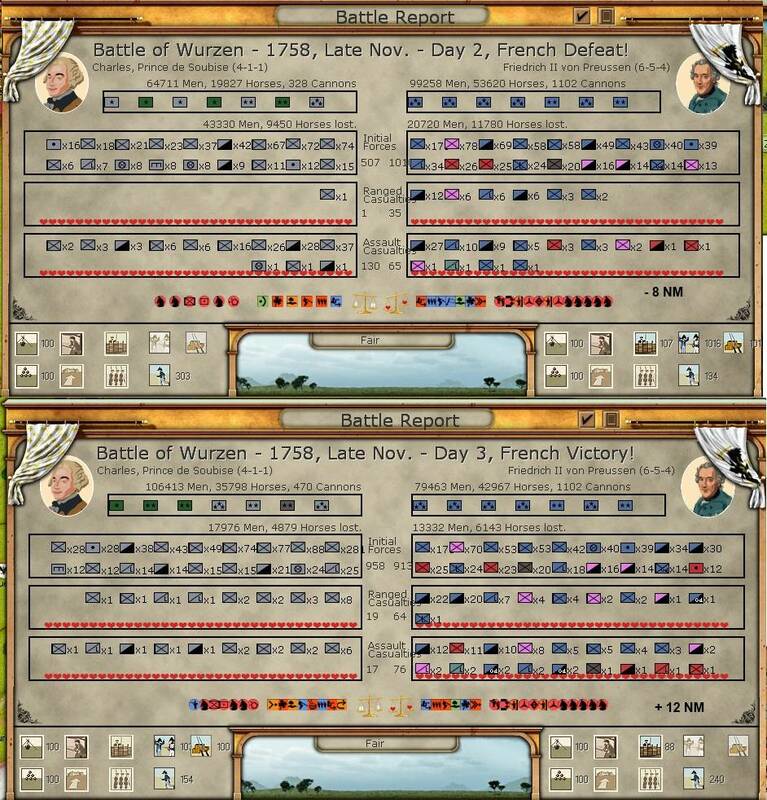 You can see that in the last 6-8 turns as reported, I had Narwhal (unusually) on the ropes and I was not going to let go- and it became more like Feb-May 1945 than the Seven Years War. I dont think the combining is unrealistic when allied countries both have troops present, it is historical. But purely Russian units having foreign commanders is not realistic, the reason armies fought mostly separate is that Prussians kept them that way. But if say Prussians would have destroyed or sieged Swedes without possibillity of escape they would have sued peace and stay out the rest of the war. Not sure about the bigger players, not likely. Different NM losses for different nations units destroyed as a solution? 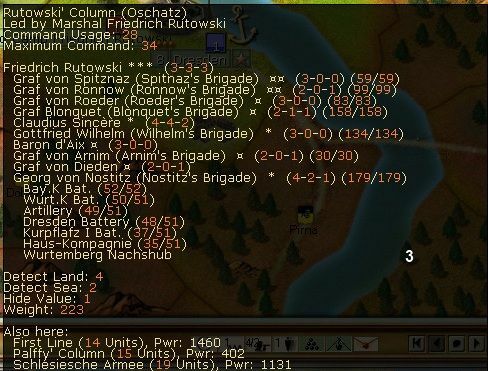 Im havent played a PBEM and cant advice in your game but when you concentrated that army and pushed it in to Saxony it was game over in my eyes. And that is realistic result, Prussia should prevent that from happening at all cost. Looks a bit sparse without the comment, but I understand your urgency, loki. One quick point I'd like to make: it looks like you copy-pasted the posts wholesale, so the hyperlinks in the text still point to the Paradox site (as opposed to the relevant posts over here). Probably not very urgent right now, but perhaps something you want to keep in mind to fix at a later time. Stuyvesant wrote: Looks a bit sparse without the comment, but I understand your urgency, loki. One quick point I'd like to make: it looks like you copy-pasted the posts wholesale, so the hyperlinks in the text still point to the Paradox site (as opposed to the relevant posts over here). Probably not very urgent right now, but perhaps something you want to keep in mind to fix at a later time. aye, my goal is once the PoN opus is over is to clean that up and see if I can repair the few broken image links. loki100 wrote: this aar was originally on the paradox aar forum but given some uncertainty about the future of that, i've decided to copy it over to here. These house rules and modifications are great. 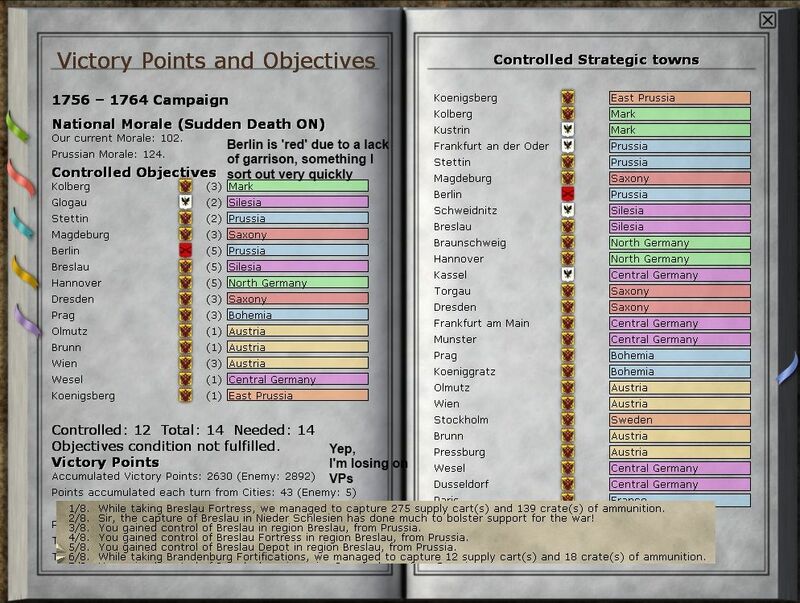 As far as I can understand you and/or Narwhal have modded default leader death chances and Swedish generals traits defined in the Models directory of GameData. Is it possible to publish or send privately changed files to let lazy player like me use your excelent work. I wonder if there is manpower bug still. And how was the house rule for non exploitation? Krot wrote: These house rules and modifications are great. I'm afraid I don't have the code changes any more, Narwhal did the original work and may still have the modded files so maybe best to PM him? The 'northener' trait is now sorted by the latest patch (as I found to my cost in my latest PBEM when they gave my Prussians a very hard time of it). In truth, as in the AAR, leader loss is still not a problem in RoP so I think its a deeper problem than just the base chance ratio. In this game, the only real loss I had was Von Bilberstein (& that so late it didn't really matter), but in my PoN game they drop on a regular basis. Baris wrote: Thanks for re-writing. This one seemed worth saving as it sets our a quite decent strategy for any beginning Austrian player. Unfortunately yes, in a game that went to 1761/2 before we abandoned it we found it was making quite a difference to the ability of the Prussians to put large armies into the field. It has to be worked as a 'trust' rule (a bit like the MC one) as you can't check, but then who wants to play PBEM and not be able to trust your opponent? loki100 wrote: ...but then who wants to play PBEM and not be able to trust your opponent? I realize I'm getting dangerously close to trolling here, but I must admit having to do a double-take at that. Or perhaps a triple, or quadruple-take. I guess there's the difference between 'trust' in that all will abide by agreed-upon rules and 'trust' in the veracity of the emails you send out between turns. Stuyvesant wrote: I realize I'm getting dangerously close to trolling here, but I must admit having to do a double-take at that. Or perhaps a triple, or quadruple-take. I guess there's the difference between 'trust' in that all will abide by agreed-upon rules and 'trust' in the veracity of the emails you send out between turns. definitely, in emails anything goes ... , after all undermining your opponents morale (or morals) is all part of the sport. [quote="loki100"]I'm afraid I don't have the code changes any more, Narwhal did the original work and may still have the modded files so maybe best to PM him? The 'northener' trait is now sorted by the latest patch (as I found to my cost in my latest PBEM when they gave my Prussians a very hard time of it). In truth, as in the AAR, leader loss is still not a problem in RoP so I think its a deeper problem than just the base chance ratio. In this game, the only real loss I had was Von Bilberstein (& that so late it didn't really matter), but in my PoN game they drop on a regular basis. As far as I can see from the discussion it this thread (Narwhal's last post) the only viable way to mod leader death casualties rate is to alter CombatDeathChance attribute in the Models directory of GameData. 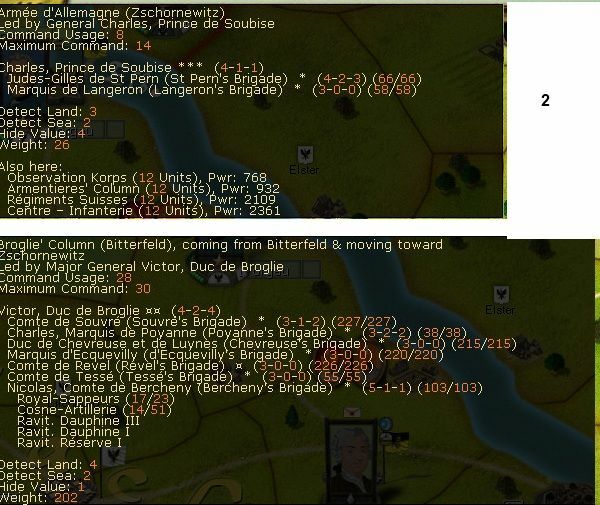 I tried this method some months ago and it seemed to work because the very first test battle ended with 1 general killed (death chances were made 10 times higher) though some other changes I made in leaders stats (strategic ratings and traits) did not worked. Any thoughts? loki100 wrote: I'm afraid I don't have the code changes any more, Narwhal did the original work and may still have the modded files so maybe best to PM him? The 'northener' trait is now sorted by the latest patch (as I found to my cost in my latest PBEM when they gave my Prussians a very hard time of it). In truth, as in the AAR, leader loss is still not a problem in RoP so I think its a deeper problem than just the base chance ratio. In this game, the only real loss I had was Von Bilberstein (& that so late it didn't really matter), but in my PoN game they drop on a regular basis. Really amazing AAR LOKI and i think Narwahl deserves some credit too for hanging on despite your 4 pronged battering ram. 1. No Inter-Allied Commanders-- no 'Ferdinand Foch style' "1918 combined offensive" to be done, all 4- Sweden, Russia, France, Austria/HRE had their own ideas. So only Austria and HRE can combine no others, no combination on Austrian side ( i mean cross of Austrian - Russian or something like that) of commanders or troops ever. No cossacks in other theaters also. 2. Saxony should die, no escapes. Will unbalance. 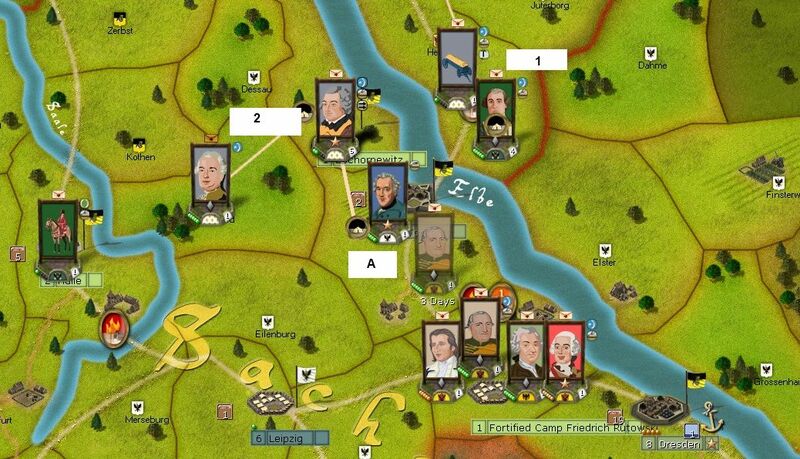 Either Player assaults Saxony and gains free cannon as Prussia or not- can be decided, but Saxony must die. 3. 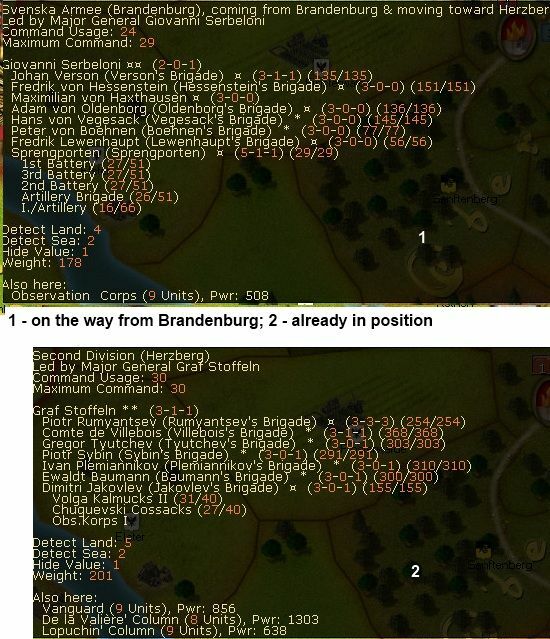 MTSG only in same region, allow Prussia to use their mobility and leaders and also troop advantage. This is not Napoleonic War with several corps MTSG and multi- day battles. More single day or even half- day battles were the norm in this time period and the troops you have are having political considerations if lost. This is my Arpaksin was punished. But Arpaksin also had supply problems as it was not so easy as in game to march across Poland into Prussian territory for the Russians. 4. Toughest Activation level, will make the ALLIED Armies- Russian, French-, Austrian etc inactive 1/3 of the times, thus more losses in winter (if retreat not done), lesser MTSG attack and more confusion. Shri wrote: Really amazing AAR LOKI and i think Narwahl deserves some credit too for hanging on despite your 4 pronged battering ram. I think my approach was less of a 'must win' and more the best I could come up with, in particular knowing Narwhal well. Not least we'd just abandoned one game that got to 1762 which he was doing far better. I hold to my basic view that Prussia is incredibly dangerous when all 3 allied armies have pressed in - say the Austrians to Dresden, French to Hannover and Russians at Kolberg. At that stage, if a Prussian player is prepared to gamble (& they have no real choice), they may be able to cripple one or two of the allied armies and manage a rough stalemate into the end game. I agree with #1. 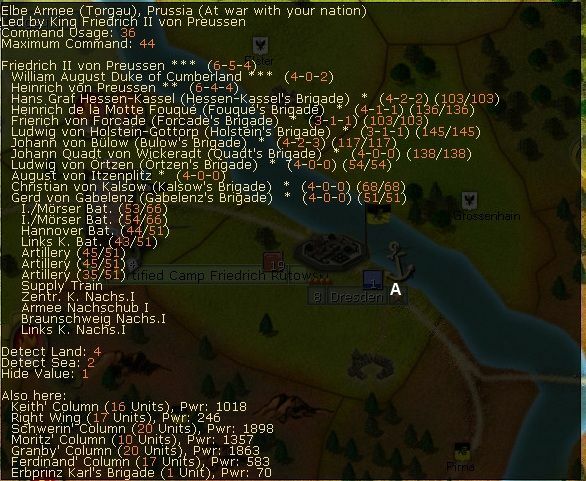 I think that Austrian, French, Swedish and Russian units must only serve under their own generals. Since HRE units historically fought with both the Austrians and the French they should be flexible. #4 I used that setting in a game vs the AI and it was excellent fun. The French in particular were operationally inept, with usually only half their corps active and you had to be really cautious over winter. Against a highly competent player like Narwhal (& this was my only win in about 10 PBEMs with him) it would be suicide. The game is stacked against Prussia but they have a limited chance right at the start - less to win and more to cripple the Austrians, you have to seriously damage their at start force. The second is as the game moves into its mid-phase when you can chuck everything at one front or the other. He did this very well in his classic 'learning from Prussia', unfortunately over on the Paradox forums.